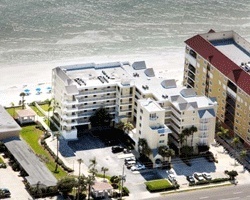 Guests need only step out the door of their spacious accommodations to feel the sand between their toes on beautiful Redington Beach. 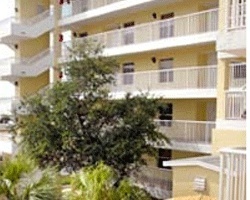 Each unit is fully furnished and equipped with such added touches as ceiling fans and a microwave. A deck area, an outdoor swimming pool, a hot tub, and smartly landscaped grounds contribute to a splendid stay at *Redington Ambassador*. Nearby are fine restaurants and shops. The Redington Fishing Pier is close by for fishing or an evening stroll. 2 back-to-back weeks every year!